She was saved by the bell after a long country walk sent her into a diabetic coma. She is one of the first to use a new sensor-controlled insulin pump that detects dangerously low levels of blood sugar and sets off a deafening alarm. Angela, 48, a financial services trainer from Harrogate, Yorkshire, has had Type 1 diabetes since she was 18. She says: ‘My husband Dennis and I had been out walking. I sat down for a cup of tea and fell asleep, not realising I was falling into a diabetic coma. Dennis, 55, put glucose tablets on Angela’s tongue and made her a cup of sugary coffee. Within ten minutes she was back to normal. Type 1 diabetes, which affects about 300,000 Britons, is an auto-immune disease with a suspected genetic link. It leaves the pancreas unable to produce insulin, the hormone essential for moving sugar out of the blood and into the body cells for energy. If it is not treated, or is poorly managed, the long-term risks are kidney failure, blindness, coma and even death. There is no cure, but it can be controlled by injecting insulin. Until now, diabetics regularly had to measure the blood sugar levels to know how much insulin to inject, but these new pumps give a continuous stream of insulin into the body. The device delivers insulin through a tube, just below the skin, at a constant rate. Even with this pump, patients may still suffer a hypoglycaemic attack – when sugar levels fall so low the brain doesn’t have enough energy to function, causing fainting, seizures or coma. The is the first pump to set off an alarm when this happens. For some, the signs are visible: shakiness, tingling in the lips, pounding heart, paleness, confusion and irritability. Others have no signs and one third of attacks occur during sleep. About 16,000 people a year are admitted to hospital with hypoglycaemia. The attacks, or ‘hypos’, are more common in Type 1 diabetics. Hypos can be caused when the patient has taken too much diabetes medication, has not eaten enough carbohydrate or has taken part in unplanned exercise. Angela says: ‘If I’d been on my own, the alarm is so loud it would have attracted someone’s attention and they would have seen the message on my monitor telling them to call 999. Angela had her first insulin pump nine years ago and was put on the new pump last year. Continuous glucose measurements are taken via a sensor inserted under the skin using a needle – no surgery is involved. Simon O’Neill, director of care for Diabetes UK, says: ‘The search for an artificial pancreas is the Holy grail in diabetes. According to INPUT, an advocacy group campaigning for improved access to pump therapy, only 3 per cent of the 350,000 people with Type 1 diabetes in the UK have pumps. This compares with 36 per cent in the U.S., 26 per cent in Israel, 20 per cent in Germany and 19 per cent in France. 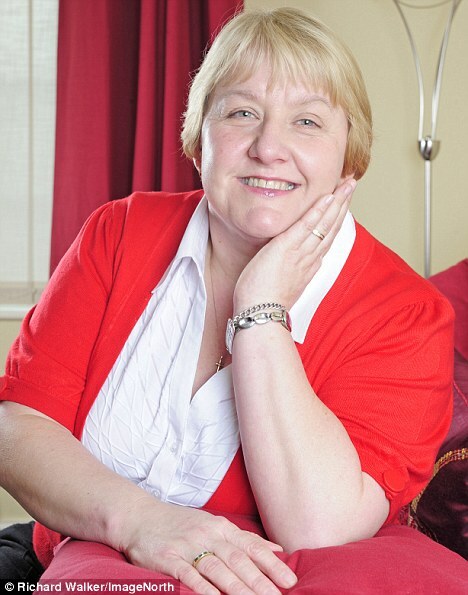 Angela’s pump therapy has been funded by her Primary Care Trust. The new pump, Paradigm Veo, costs £2,850 and the consumables cost about £1,500 annually. Angela says: ‘It provides immediate information about what’s happening in your body every minute, and this allows you to make the necessary adjustments to your intake of insulin and to what you eat. ‘A graph on the sensor shows you what your blood sugar has been doing over the past three, six and 24 hours. ‘If I climb a hill, I can lose energy very quickly. The sensor warns me when this is starting to happen, so I eat something before my glucose levels get too low. 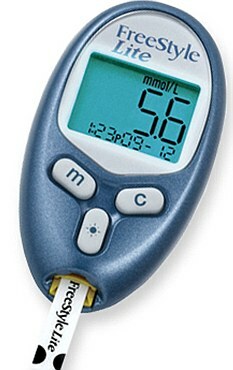 Most people with Type 1 diabetes manage their blood glucose by fingerprick tests and injections. This requires planning when to eat and exercise, which children can find difficult. Most Type 2 cases manage their condition with diet, exercise or tablets – insulin use is a last resort. NICE recommends pump therapy for children with Type 1 diabetes when doctors believe injections are inappropriate. It recommends it for adults if injections have failed; for those who suffer repeated hypos or diabetics so worried that the fear has a negative effect on their life. Dr Peter Hammond, a consultant diabetologist at Harrogate District Hospital, estimates more than 60,000 people in the UK would benefit from them. But Simon O’Neill says there is evidence that an estimated saving of £23,532 over two years can be derived from pump use, as a patient will have fewer hypos and hospital visits. This entry was posted on April 19, 2010, 3:12 pm and is filed under News. You can follow any responses to this entry through RSS 2.0. Both comments and pings are currently closed. A pump would be a godsend for my 9 year old daughter, not only because it would warn her that her blood sugar levels were high or low, but it would take away the embarrasment and pure hassle of having to inject. She hates being different from her friends and anything to ease this would be fantastic…..